When to Impose Your Gringo Values on Other Cultures? The story of an Expat Chronicles video irreversibly removed from YouTube for a violation in offending gringo values. The story of my first legal action in Latin America, a claim to recover the security deposit for an apartment in Lima, Peru. The founder of an NGO in Colombia explains two of the top territory hazards of trying to make a difference. An introduction to my latest publishing project, Peru Reports, an English-language news service from Peru. Book review and summary of Red Notice, in which American businessman Bill Browder takes on the Russian oligarchy in business and legal justice. Who put the black-hat SEO links on the website of the Santa Catalina monastery, the 5th most visited tourist site in Peru? Previewing the Expat Chronicles Podcast, including a free download of a chapter from the Mad Outta Me Head audiobook. A look at Inca Kola’s epic failure to sell a chicha morada soda. My review of 30 Days of Discipline by Victor Pride. 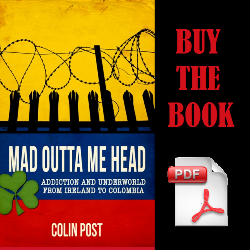 An excerpt from Mad Outta Me Head on the old El Cartucho district of Bogota, which was a un-policed neighborhood of drugs and addiction. A look at the proposed Nicaragua Canal, and an opportunity to support an effort to document with photos and testimony the planned path of the canal. Acknowledging the patrons of the work-in-progress, This Mick’s Life, a biography of Irish drug mule, Christopher Kavanagh. Announcing my recent interview with Richard McColl on Colombia Calling Radio. Also announcing Expat Chronicles Radio … someday. A look at the ‘Peru Two’, Michaella McCollum and Melissa Reid, who were caught smuggling cocaine from Peru. With analysis of the industry from a former smuggler.